With more than 30 years of experience in divorce law, probate, estate planning, business and real estate matters, our firm approaches cases thoughtfully and efficiently. Our role is to aid our clients in creating a foundation that will support their life and business goals. Copies are available to purchase at Sundance Bookstore in Reno, Nevada. Our goal with each and every client is to provide an unobstructed view of all aspects of a case aiding in informed decision-making and a clear understanding of possible outcomes. We have more than 30 years of experience in divorce law, probate, business, bankruptcy, custody, and real estate matters. This experience allows our firm to assist you with your family law needs as life and situations evolve. Our role is to aid our clients in creating a foundation that will support their life and business goals, whether that involves Buy Sell Agreements, the establishment of trusts, or planning for the transfer of assets. We create the groundwork to help our clients adapt as the world does. Life offers unavoidable times of distress. These times can be centered around the death of a loved one, a divorce or any number of occurrences. The only thing worse than experiencing one of these events is experiencing one without proper planning. Conflict and stress are inevitable. Our goal is to prepare our clients for life’s challenges. Should the worst occur without a plan in place, Gloria M. Petroni has the experience to navigate complex situations. Her extensive experience with real estate transactions, trusts, wills and business entities, allows her to represent clients effectively, often without research or outside advisors. In the event an outside consultant is necessary, such as for a business valuation, our firm associates are the most experienced advisors available. The firm offers state of the art technology and trained staff to deliver results on time and at a reasonable cost. Above all, Petroni Law Group offers straight answers to your questions in terms that you can understand. We give clear options as to how to handle your divorce, guardianship, probate or trust administration issues, or better yet, prepare you for life’s changes. The first step is an initial consultation. Get your questions answered and develop a plan that allows you to move forward. The meeting usually takes about an hour and you willll leave with an action plan for achieving your outcome. We can meet in our offices or by phone or video conference. There is nothing stopping you from representing yourself in a divorce or other family matter, but generally speaking, it is a good idea to seek legal representation. The benefits of hiring an attorney can outweigh any financial burden it may cause you at first. Family law consists of the discipline that deals with family-related matters and domestic relations. those in more distant or casual associations as well. With more than 30 years of experience in divorce law, probate, estate planning, business and real estate matters, our firm processes your case thoughtfully and efficiently offering an unobstructed view of all aspects of the case. We promptly respond to your phone calls, or emails. We provide guidance and counsel throughout your case. We promptly respond to your phone calls, or emails. We provide guidance and counsel throughout your case. You will not wait by the phone for days waiting for a call from your lawyer. We run our law office like a family business. Our staff is professional yet supportive and friendly. We have high marks in customer service, transparency, responding to questions quickly and in terms you can understand. We have systems in place to deliver information to you, and to plan your case strategy and execute to complete. Yes, it’s a tough journey, but you are comforted by your lawyer who will sit side by side with you. You will not be alone and you will not feel ignored. We actively respond to ensure we understand your issue and provide ways for you to manage the issue. We don’t just listen while typing emails to other clients. We try to explain the legal thinking underlying your issue, and why we have advised you the way we did. Our legal assistants have open access to Gloria M. Petroni to get your questions answered quickly. If she is unavailable, a time will be scheduled for a phone call with Gloria M. Petroni. We guarantee a returned phone call within twenty four business hours. You are provided information as to the law applicable to your case. You see and approve documents prior to their being filed. You are provided information as to the law applicable to your case. You see and approve documents prior to their being filed. You get copies of every document related to your case by email, fax or mail. You will receive itemized, detailed bills regarding the legal work performed by you monthly. We are experienced and have deep skill sets in multiple areas of the law such as real estate, business, trusts, estates, judgments, and bankruptcy. We are experienced and have deep skill sets in multiple areas of the law such as real estate, business, trusts, estates, judgments, and bankruptcy. We are focused on giving value to our clients at a reasonable cost. We have the state of the art technology in a near paperless office, which results in efficiency and lower costs to you. We don’t take any legal steps just to make money. Each legal step is either necessary or recommended to benefit you. We discuss goals and the means to affect your goals; and execute towards your goals. We do not give you unreasonable expectations. We discuss goals and the means to affect your goals; and execute towards your goals. We do not give you unreasonable expectations. The proof is in our firm’s results, and our clients’ high level of satisfaction. Our firm is not only respected for its integrity, and hard work, but also for the firm’s excellence in negotiations and a force to be reckoned with in the courtroom. Our firm is not only respected for its integrity, and hard work, but also for the firm’s excellence in negotiations and a force to be reckoned with in the courtroom. We know when to negotiate, when to mediate, and when to litigate. We understand how difficult the process is that you are going through, and we are here to help you through. We understand how difficult the process is that you are going through, and we are here to help you through. We can patiently listen to make sure we understand your questions and issues, and then provide you with an analysis of the law related to your question or case, and give your our best advice. Even with over thirty years of experience, we have passion and energy in getting the best result for you. Not only is our firm prepared to meet deadlines, but you will be prepared for any negotiations or court testimony, if necessary. Not only is our firm prepared to meet deadlines, but you will be prepared for any negotiations or court testimony, if necessary. In negotiations, mediation, settlement conferences or court appearances, you will be proud of your decision to be represented by our firm. We get the job done honestly and thoroughly. We ask you the tough questions before the other side does. You will be briefed on what to expect, and what you need to know. The knowledge you will have will empower you and calm you in a time of high emotion. Gloria M. Petroni is a Certified Family Law Specialist certified by the Nevada State Bar. 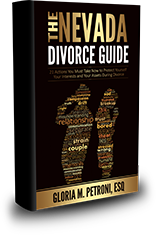 Gloria M. Petroni is a Certified Family Law Specialist certified by the Nevada State Bar. As such, she is aware of possibilities to create the desired result through a thorough understanding of the underlying nature of each of your assets and liabilities, including business interests and your separate property interests. We are committed to not making the relationship between you and your spouse worse. Anything that you speak to us about will be held in the strictest confidence, unless you direct us to make a disclosure. Our firm is always informing you of options in your case, and what the cost of each is, and an independent analysis of each option and if it is best for you, and not our firm. You know our firm is on your side. Anything that you speak to us about will be held in the strictest confidence, unless you direct us to make a disclosure. This right continues after your matter is concluded in perpetuity. With our firm’s experience of over thirty years in family law, you will not get a result that was an unexpected loss for you. With our firm’s experience of over thirty four years in family law, you will not get a result that was an unexpected loss for you. Even if it is not what you want to hear, you hear the truth. We will seal your family law file at the courthouse to provide the maximum amount of privacy to you in your case. "Gloria represented me in a child custody case. She did an incredible job and I had to do basically nothing. I got everything I was looking for with her “aggressive” style. I would recommend her to anyone."